Believed to be 2720952 Guardsman Willianm Charles Angell of the 1st Battalion, the Irish Guards. Son of William and Edith Angell; husband of Elsie Rosalie Angell of Yealmpton. Born in 1915. Died 26 January 1944 aged 29. 82363 Lance Sergeant Stephen Robert Vosper Arthur of 510 Field Company. the Royal Engineers. Son of Daniel and Sarah Arthur. Born in Kingsbridge in the June Quarter of 1919. Died 23 December 1943 aged 24. Buried in the Churchyard at Dodbrooke. D/J 32781 Petty officer Walter Vincent Bennett of the Royal Navy, HMS Courageous. Son of Alfred and Emma Bennett of Kingsbridge; husband of Gladys Bennett of Kingsbridge. 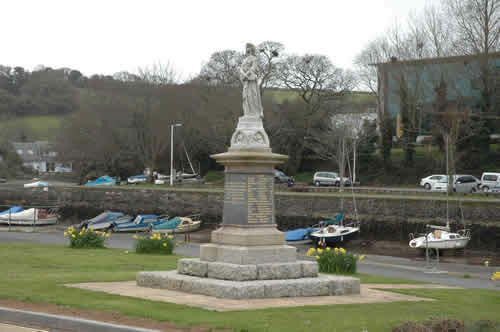 Born in Kingsbridge in the march Quarter of 1899. Died 17 September 1939 aged 41. 1701226 leading Aircraftman Richard Alan Blackler of the RAF Volunteer Reserve. Son of Richard and Gladys Blackler of Kingsbridge. Born in Kingsbridge in the December Quarter of 1922. Died 20 October 1945 aged 23. Midshipman William John Eowett Bowhay of the Royal Navy, HMS Royal Oak. Son of William George and Ethel Bowhay. Born in Kingsbridge in the the September Quarter of 1921. Died 14 October 1939 aged 18. 1514952 Private Frederick Caseley of the South Lancashire Regiments (the Prince of Wales Volunteers), Born in Plymouth in the June Quarter of 1918. Died 4 January 1945 aged 27. 1522573 Sergeant Russell Jesse Chapman of 460 Squadron, the RAF Volunteer reserve. Husband of Muriel Irene Chapman. Born in 1913. Died 20 April 1943 aged 30. 1321550 Sergeant Horace Clarence Cope of 76 Squadron, the RAF Volunteer reserve. Son of George and Florence Cope; husband of Irene May Cope of West Alvington. Born in Kingsbridge in the September Quarter of 1921. Died 6 March 1943 aged 22. D/JX 158976 Boy Leslie George Edgecombe of the Royal Navy, HMS Glorious. Born in Kingsbridge in the June Quarter of 1923. Died 8 June 1940 aged 17. Chief Officer William Edward Ford of the Merchant Navy, SS Eumaens (Liverpool). Son of John and Caroline Ford; husband of Rowena Ford of Kingsbridge. Born in Kingsbridge in the September 1898. Died 14 January 1941 aged 42. LT/JX 185438 Seaman Cook Alexander James Griffin of the Royal Naval Patrol Service, HM Trawler Sisapon. Husband of Lillian Griffin of kingsbridge. Born in Liverpool in the March Quarter of 1895. Died 12 June 1940 aged 45. 7518042 Private Cyril Wesley Samuel Harrison of the Royal Army Medical Corps, 62 General Hospital. Son of Samuel and Florence Harrison. Born in Kingsbridge in the June Quarter of 1914. Died 10 May 1942 aged 28. 14685306 Lance Corporal Cyril Leslie Kirton of the 5th Battalion, the Dorsetshire Regiment. Son of William and Gertrude Kirton of Kingsbridge. Born in Kingsbridge in the June Quarter of 1925. Died 20 November 1944 aged 19. 146806 Able Seaman Wilfred Donald Knapman of the Royal Navy, HMS Exeter. Son of William and Laurie Knapman in the June Quarter of 1926. Died 1 March 1942 aged 22. Believed to be 128691 Able Seaman Cyril Lane of the Royal Navy, HMS Gloucester, Parents not known. Born in Kingsbridge in the September Quarter of 1911. Died when the ship was sunk 22 may 1941 aged 30. 5626630 Corporal Roland William James of the 1st Battalion, the Devonshire Regiment. Son of William and Ida Land; husband of Marjorie Land of Carlisle. Born in Devonport in the march Quarter of 1914. Died 4 March 1945 aged 30. T/14778806 Driver David James Lamble of the Royal Army Service Corps. Son of William Henry and Flossie Lamble of Kingsbridge. Born in Kingsbridge in the June Quarter of 1926. Died 27 December 1945 aged 19. * His Majesty's Australian Hospital Ship Centaur. 156008 Flying officer William Thomas Easterbrook of 521 Squadron, the RAF Volunteer Reserve. Son of Henry and Clara Legg; husband of Elizabeth Legg of Halifax, Yorkshire. Born in Kingsbridge in the September Quarter of 1920. Died 28 October 1944 aged 24. C/MX 125407 Petty Officer Charles Harold lethbridge of the Royal Navy, HM LCT 717*. Born in Kingsbridge in the June Quarter of 1921. Died 6 June 1944 aged 23. D/K 28218 Petty officer Stoker Herbert Luscombe of the Royal Navy, HMS Courageous. Son of William and Rose Luscombe; husband of Lilian mary Luscombe of Kingsbridge. Born in Kingsbridge 24 June 1895. Died 17 September 1939 aged 44. D/KX 777736 Chief Stoker Robert Arthur Peck of the Royal Navy, HMS Repulse. Son of Robert and Frances Peck; husband of Florence Helena Mary Peck of Kingsbridge. Born in 1908 - the whereabouts were not recorded by the Army with whom his father served. Died 10 December 1941 aged 33. 5625203 Private William Howard Prowse of the 4th Battalion, the Devonshire Regiment. Son of Stephen and Florence Prowse of Kingsbridge. 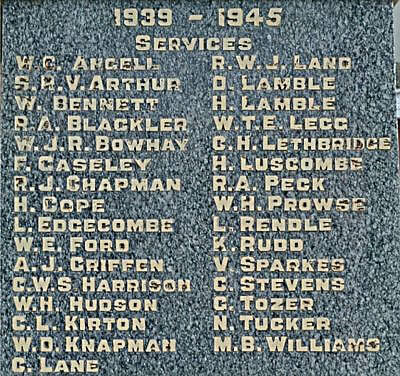 Born in Kingsbridge in the December Quarter of 191.. Died 10 July 1944 aged 28. 14692609 Private 5th Battalion, the Wiltshire Regiment. Son of William and Louisa Rendle of Kingsbridge; husband of Vida Elsie Rendle of Kingsbridge. Born in Kingsbridge in the June Quarter of 1911 aged 33. * His Majesty's Boat Yard Mine Sweeper. Believed to be Lance Corporal Cyril William James Stevens of the 1st battalion, the Royal Sussex Regiment. Son of James Tucker Stevens and Caroline Stevens; husband of Joan Eleanor Stevens, of Maidenhead, Berkshire. Born in Totnes in the March Quarter of 1920. Died 30 September 1944 aged 24. 5682598 Private Norman Worth Tucker of the 4th Battalion, the Somerset Light infantry. Son of Albert and Elizabeth Tucker of Kingsbridge. Born in Kingsbridge in 1923. Died 29 May 1944 aged 21. Buried in Dodbrooke Churchyard. D/JX 567526 Ordinary Seaman Maurice Bennett Williams of the Royal Navy, HMS Mahratta. Parents not yet confirmed. Born in Devonport in the September Quarter of 1925. Died 25 February 1944 aged 19.